Last year we began to revitalize the garden design of a Burnt Hills property known as “the bluebird house” and build the habitat capacity by adding native plants. Native plant landscape design takes patience, the plants need a couple years before they really look like what they’re going to. 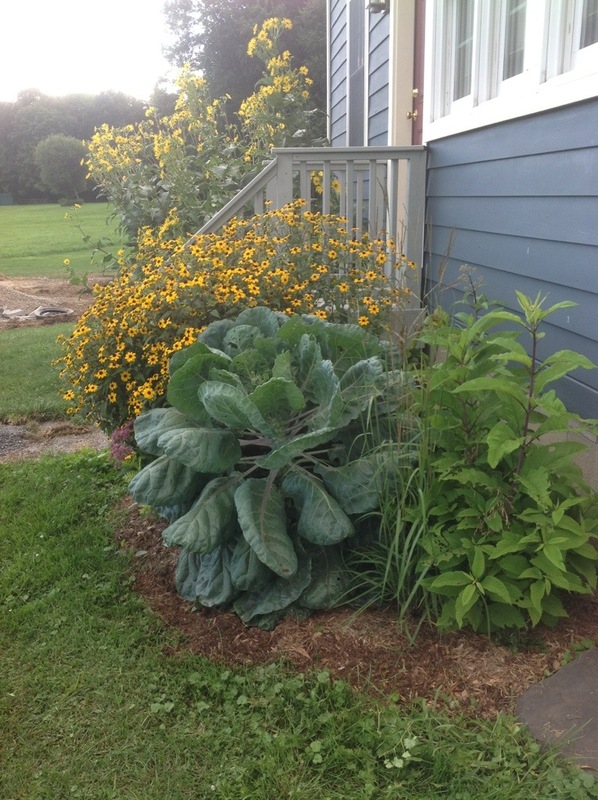 At the bluebird house, we have augmented with a number of edible plants, Brussel Sprouts are visible here in the photo next to the Andropogon gerardii, Big Blue Stem Grass. Lots of the prairie native plant species are in their full bloom during late July and August, like the Rudbeckia triloba shown here. 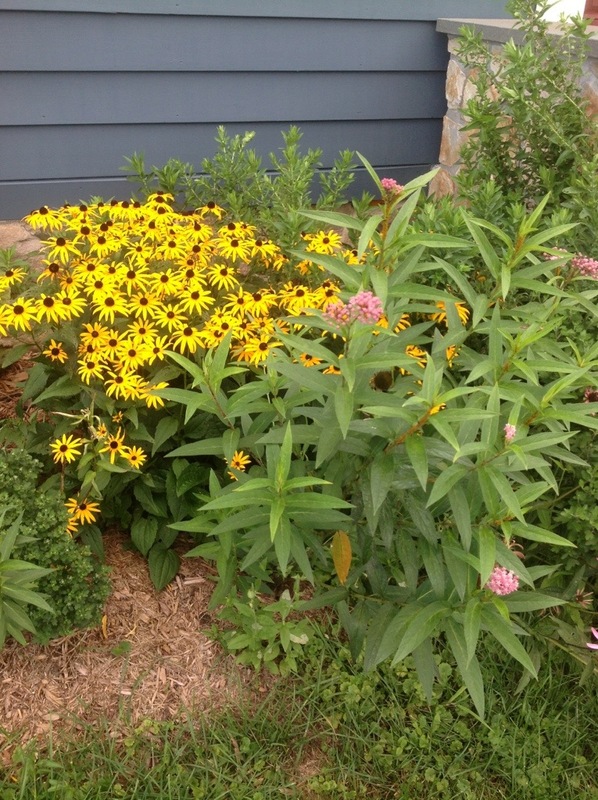 Eupatorium dubium, Little Joe Pye Weed and Tansy vulgaris, Common Tansy peak through underneath the lush Rudbeckia. 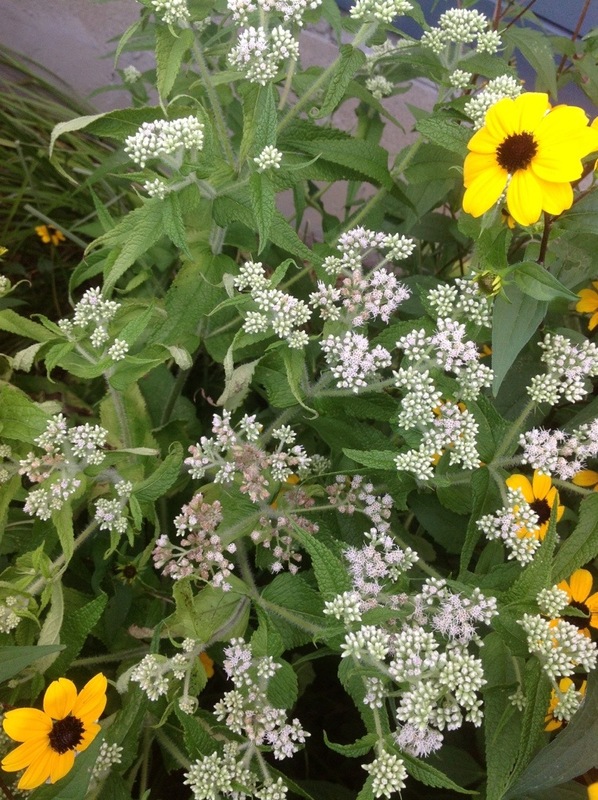 The Eupatorium perfoliatum, Boneset in bloom; Boneset is a classic native plant, zero maintenance and at home in a formal garden setting or a wildflower one. 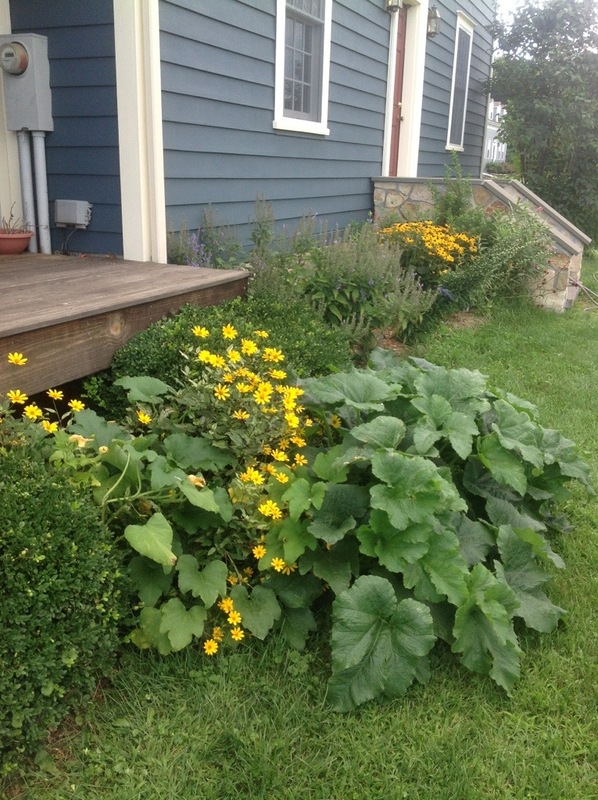 Last year’s Jack-o-Lantern fell off the porch sometime mid-winter and bore the lovely, spontaneous pumpkin patch shown here. 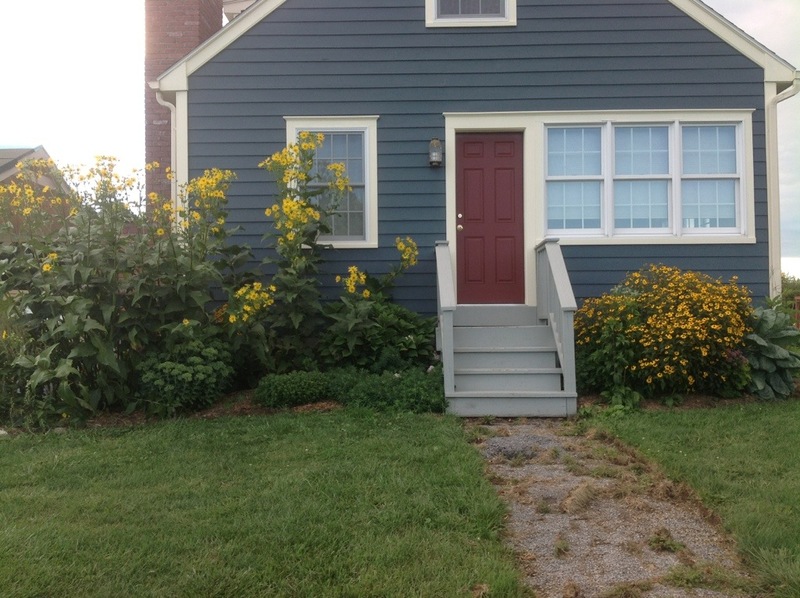 Lots of wonderful native plants are located on this side of the house, which faces the street. Notably, Scutellaria incana, Scullcap puts on a months long display of refined purple-blue habitat flowers, feeding neighborhood butterflies, pollinators and birds profusely. Scullcap is also well known for its medicinal qualities; the higher quality herbal tea operations use Scullcap in blends for its relaxing and healing properties. 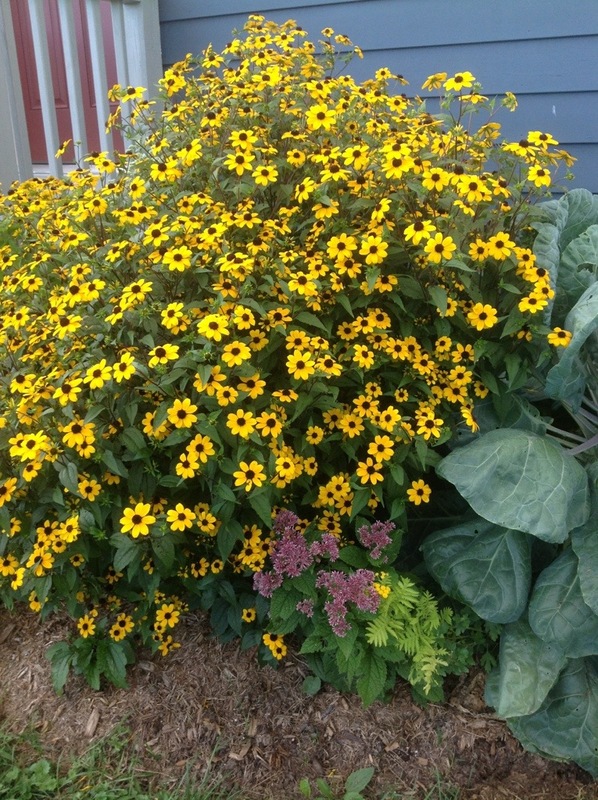 In between the pumpkin patch there is a healthy native sunflower, a variegated Heliopsis sp. The late color will continue into next month when these Symphyotrichum novae-anglicae, New England Aster at the right rear come into bloom. Up front there’s the classic Monarch butterfly habitat plant: Asclepias incarnata, Pink Milkweed. The bluebird house property is located in the heart of Saratoga county, Burnt Hills is rich with beautiful farm lands, wetlands and forests. Prior to World War II, upstate New York was a productive hops growing region, and it seems this part of Saratoga County was an active part of that agricultural niche. (There’s a road in Burnt Hills called, “Hops City Road.”) The climate of our ecosystem is balmy, temperate and well suited to growing hops successfully. Unfortunately, in the mid twentieth century, a mildew epidemic wiped out the hops economy here, but pockets of hops farms and orchards are being revived, and given the miles between the relative farms they are not able to inoculate each other in the same windblown way; the distance brings safety. We plan to plant some hops vines late this August at the bluebird house; native hops are a larval host to many of our butterfly species. And, at some point the homeowners will be able to produce a, “Bluebird House Lager,” or some other homebrewed specialty beer.